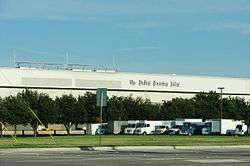 The Dallas Morning News is a daily newspaper serving the Dallas–Fort Worth area of Texas, with an average of 271,900 daily subscribers. It was founded on October 1, 1885, by Alfred Horatio Belo as a satellite publication of the Galveston Daily News, of Galveston, Texas. Historically, the Morning News has tilted conservative, mirroring Texas′ drift to the Republican Party. However, on September 7, 2016 it endorsed Hillary Clinton for president, the first time it had endorsed a Democrat for president since Franklin D. Roosevelt in 1940. This came a day after it ran a scathing editorial declaring Republican candidate Donald Trump "not qualified to serve as president." It was the first time that the paper had refused to endorse a Republican since 1964. ↑ "Dallas Morning News Media Kit". Dallas Morning News. ↑ "2012 Top Media Outlets 2013; Newspapers" (PDF). BurrellesLuce. 2012-03-13. Retrieved 2014-01-02. ↑ "BELO, ALFRED HORATIO". tshaonline.org. ↑ "After stormy but successful Democratic convention, it's Hillary's party now". The Dallas Morning News. 2016-07-29. ↑ "We recommend Hillary Clinton for president". The Dallas Morning News. 2016-09-07. ↑ "Donald Trump is no Republican". The Dallas Morning News. 2016-09-06.